Bird Id - Forum - Identifying Birds - Black Bird With Orange Crest? Forum > Identifying Birds > Black Bird With Orange Crest? 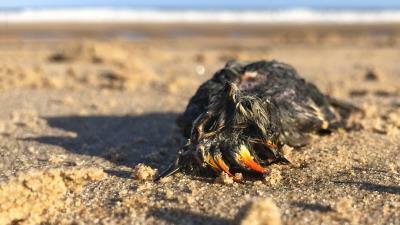 1 Spotted this (dead unfortunately) bird on the beach at Seaburn near Sunderland on the North East coast. It was about the size of a sparrow, all over black but with what looks like a bright orange/yellow crest. I have absolutely no idea what it is so hoping someone here can help.